I've been using PDFCreator and Thunderbird 32bit for a few years with no problem. Last days I switched to 64bit of Thunderbird. Now creating and sending pdf to email client is crashing Thunderbird every time. I'd like to stay with 64bit version of Thunderbird because it's notable faster for me. I just tried it with Thunderbird 65.0b2 and had the same issue. Basically, the log tells us that PDFCreator starts Thunderbird using MAPI. Since Thunderbird for Windows 64-Bit is still an unstable beta, you should consider reporting the issue to mozilla if they're not already aware of the issue. I reported the issue to thunderbird forum. The issue is known and the fix is on the way. Workaround with script works with TB 65 beta 3 x64. Thanks for tip! In latest TB beta creating and sending pdf to email client works good. No workaround needed. I'm creating pdf file, then I'm sending it to PDFCreator printer with special setup. 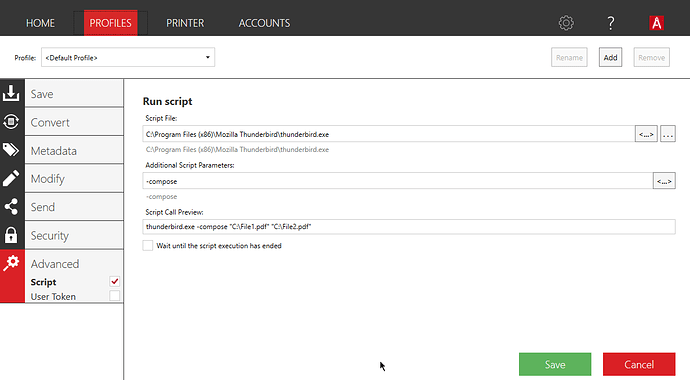 One action is printing on physical printer immediately, second action is open Thunderbird compose window with pdf attached and message content filled. Problem solved with TB 65.0b4.